Advance Steel® BIM system is specifically designed for structural engineers and steel detailers who require a comprehensive yet user friendly 3D structural steel detailing software that automates the production of drawings, BOMs and NC files. 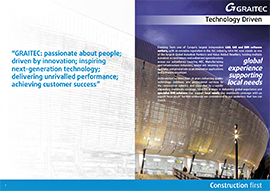 Advance Steel accelerates the design phase (single or multi-user mode) by offering an extensive library of smart objects, automatic joints (connections) and specific tools for creating standard structures, stairs, railings and miscellaneous steelwork. Advance Steel automatically generates all workshop and general arrangement drawings with intelligent tools to control dimensions and labels with all required views of objects and assemblies. Common Industry Frames, Bracings, etc. – Automated drawing creation: Once the design is completed, Advance Steel offers a wide range of automated functions to create all the fabrication and general arrangement drawings. 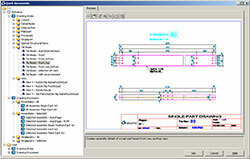 Creation of individual fabrication drawings for single and assembly parts. ll parts are automatically dimensioned and labeled with the required information. Once the drawings are completed, bills of material (BOM), lists and NCfiles can be created. The user can select from different predefined or custom formats: content definition, insertion of logos, customizable sorting, etc. Advance Steel automatically creates revision clouds in drawings for modifications compared to the previous status of the drawing. This considerably helps users have better control on changed elements after an automatic update of the drawings with a revision number.